Home / Reiki Benefits / What are the Benefits of Reiki? Reiki is based on the principal that “all is energy”. This energy is better known and referred to as “Universal Life Force Energy” (LFE). Reiki has various benefits and can be used as a stand-alone or additional form of treatment for a variety of ailments and/or pain. The benefits of Reiki can be experienced by both young and old. Reiki can also benefit animals. Reiki is a Holistic form of healing. This means that it focuses not only on one aspect of a person (such as the physical) but instead focuses on the body, the mind and the spirit. Therefore, Reiki can be used to achieve and maintain an overall feeling of wellbeing. During a Reiki treatment the Reiki Practitioner channels Reiki energy (Universal Life Force Energy) to the recipient. 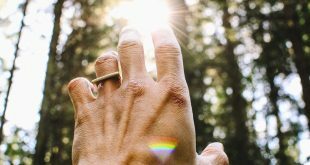 This is done by a method of “laying-on-of-the-hands.” Reiki is used to remove energy blockages in the Recipient’s energy system and balances and enhances the Recipient’s own energy. A Reiki treatment ultimately brings about a feeling of balance and inner peace. The outcome of a Reiki treatment is different for each individual, as each person will experience the energy in a different manner and each person will gain what is required from their treatment. One can say that “Reiki energy goes where it needs to go” and “Reiki energy does what it needs to do”. One does not have to be ill or experience pain in order to receive a Reiki treatment, as Reiki is also a very effective method of stress relief. Reiki is becoming more and more popular all over the world and there are some Medical Insurances, which now recognize Reiki as a valid form of treatment and there are also various Hospitals that are offering Reiki as an add-on treatment to their patients. Reiki removes energy blockages in the Recipient’s energy system. It balances and enhances the Recipient’s energy system – ultimately assisting the Recipient’s body to heal itself, as it focuses on body, mind and the spirit. 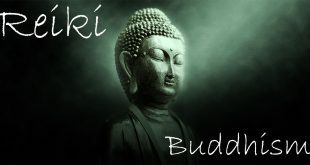 Reiki calms both the mind and the emotions – Thus, it brings about a feeling of inner peace and harmony. Reiki stimulates the immune system and assists the body to release toxins – ultimately it improves and maintains general health. 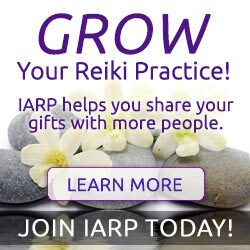 Due to its balancing “abilities” Reiki brings about an overall feeling of well-being. Reiki can improve concentration and one’s memory. Reiki can enhance one’s creativity. Reiki increases one’s overall level of awareness. Reiki is a very beneficial aid to relieve insomnia, as it balances the mind and the emotions – it ultimately aids in better sleep. Reiki is a very effective method to reduce stress and enhance relaxation – Thus, it enables one to better cope with the “normal” stresses and pressures of daily life. Reiki can relieve the symptoms of fatigue (or chronic fatigue syndrome). Reiki can relieve the symptoms of allergies and sinus. 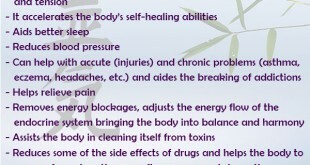 Reiki can stabilize the blood pressure. It balances the organs and glands. Reiki is very effective to relieve pain, such as pain caused by muscle spam, headache, migraine, arthritis and menstrual pain, to mention a few. Reiki can assist in the healing process, following an operation. Reiki can be beneficial as an add-on treatment for patients with HIV/Aids. Reiki can be used to treat depression. (Although, in severe cases the patient is advised to seek the appropriate medical care). Reiki is an effective aid to assist with weight-loss. Reiki has also been found to be effective in the treatment of addiction. Reiki can assist children whom have been diagnosed with ADD and ADHD. Reiki can assist pregnant woman during child birth. Anyone can benefit from a Reiki treatment. Reiki is beneficial to adults, the elderly, children, toddlers, babies and animals. As mentioned earlier, you do not need to be ill, or suffer from pain, in order to receive a Reiki treatment. As there are so many benefits of Reiki, anyone can receive a treatment at any time. This varies entirely from individual to individual. If a Reiki treatment is done purely for the purpose of stress relief and relaxation, then one may find that one treatment would be sufficient, as the effects are noticeable immediately. But in cases where there are more severe imbalances or energy blockages, more treatments may be required. Once again, this depends on the individual and the Reiki Practitioner will be better able to advise the Client on how to proceed forward. A Reiki treatment normally lasts between 60 min to 90 min. The Client is fully clothed during the treatment and only the shoes are removed. The Reiki Practitioner channels Reiki energy (LFE) to the recipient, by holding his or her hands just slightly above the recipient’s body. In some cases the recipient can sense the energy that is being channeled and for some, the benefits of Reiki can be experienced long after the treatment is over. Next Who can Learn Reiki?